3) In addition to the proven Fastback, introduce a convertible body style as a 1967-1/2 model (mid-year). Other plans included offering a coupe body style and a Shelby Cougar XR-7S, though we're not quite sure if those were being planned as mid-'67 or 1968 models. This plan was put into motion on August 8th, 1966, when Shelby American began placing orders for 1967 model year cars with Ford Motor Company. In the first three days of placing orders, a total of 111 cars were requisitioned -- there was one G.T. 500 coupe, one G.T. 500 convertible and the rest were G.T. 350 and G.T. 500 fastbacks. Unfortunately, as soon as Shelby attempted to fit their pre-ordered supply of fiberglass components to the first batch of cars delivered by Ford's San Jose assembly plant (late September / early October), the operation was plagued with fiberglass fitment issues, supply chain and financial problems. These "launch problems" prevented Shelby from being able to finish cars so Ford immediately stepped in and took control over the struggling operation. FoMoCo's Dr. Ray Geddes took over operations and ordering who then called upon Fred Goodell to move from Dearborn to Los Angeles and become Chief Engineer. After identifying the source of the production problems, Ford recruited A.O. Smith Plastics in Ionia, MI to help solve the primary problems which all related to the design, fabrication and fitment of the fiberglass components. Throughout October, Shelby American managed to complete approximately a hundred cars -- all were G.T. 350 cars. In November, the first big block G.T. 500 cars, including the coupe, convertible and fastback were completed by Ford's San Jose assembly plant. This trio became the first dual-quad 428 cu.in. Mustangs built by Ford and subsequently the first big block G.T. cars delivered to, completed by and serialized (0100, 0131 and 0139) by Shelby American, Inc.
All three were designated "company cars," assigned to the engineering department and fitted with the same '67 livery as all December '66 built G.T. cars (fiberglass hood, one-piece front-end, one-piece grille, inboard high-beams, modified rear valance, Cougar tail lights, exhaust tips, emblems & stripes). Though Carroll Shelby stated that the convertible was his "personal driver," subsequent interviews with former employees indicate "the convertible was being driven by one of the gals who worked in the upstairs executive offices at the LAX facility." Quality issues and production problems, primarily caused by the cars' hastily designed fiberglass modifications, continued to plaque the operation. Shelby's last fulfilled orders were placed in March 1967 and the original plan for 1967½ convertibles was scrubbed. This decision ultimately resulted in the first '67 G.T. 500 convertible (0139) built becoming the only '67 G.T. convertible ever built, and the first '67 G.T. coupe (0131 - "Little Red") becoming the only '67 G.T. 500 coupe ever built. With FoMoCo's updated "function before form" design of the '68, A.O. Smith fabricated and shipped two sets of redesigned hoods, front-ends, tail light panels and consoles to California. In April 1967, Shelby American was tasked with installing the components on two cars, a fastback and a convertible. The updated cars would be used for advertising ("photographic") purposes. Several hundred photographs were taken multiple scenic Southern California locations, including Malibu Beach, Hollywood Park and the mountains of Idyllwild. 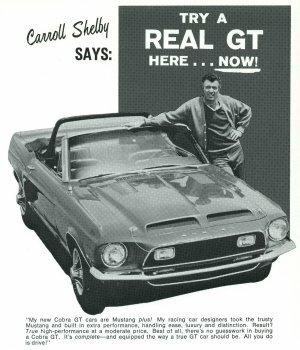 Circa April 1967, about six months after Ford first intervened, the decision to terminate the California-based Shelby Program was made. In August 1967, Shelby American, Inc.'s assets, including the engineering cars, were shipped to Ford's headquarters in Dearborn, MI. In October 1967, the photos previously taken of the disguised convertible and fastback made their way to printed brochures, magazine ads and dealer literature that was used for the promotion of the upcoming 1968 model year Shelby Cobra G.T. cars. Though we're not sure when, we believe Ford eventually sold the convertible as a used car, either through it's corporate lot or through a retail dealer, thus fulfilling the convertible's destiny of being owned by an enthusiastic member of the public -- just as it was originally intended. After several years of researching and documenting this convertible's special history, Jason Billups was entrusted to perform the Concours-level restoration with the priceless technical contributions from many experts, enthusiasts and past employees in the Shelby community. Today, the convertible has been restored to its "earliest point as a Shelby" and wears 1967 Shelby styling and upgrades, just as she did in December of 1966 when the legendary Carroll Shelby first took the wheel of this multi-carbureted big-block drop-top.